As with everything in today's announcement, the Home Hub has been leaked more than once in recent weeks. 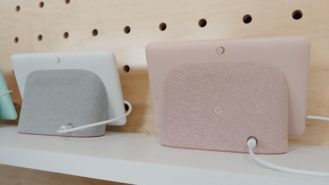 Google's own-branded Assistant Smart Display, as expected, resembles a tablet glued onto a fabric speaker base, and it's sadly not removable so it can't be used as a standalone tablet. The display is a 7" touchscreen LCD (no resolution given) which makes it smaller than the efforts from Lenovo (8" and 10") and JBL (8") already on the market. Those smart displays have a camera for Duo video calling, something conspicuous by its absence on the Google Home Hub. The front does house two far-field microphones either side of light and color sensors — there's an Ambient EQ setting that finetunes the brightness and color of the display throughout the day. On the back of the screen there's a volume rocker and switch to mute the mics, and on the fabric part we see the familiar Google logo and the port for the 15W power adapter. Bluetooth and WiFi are on board, just like any Google Home. 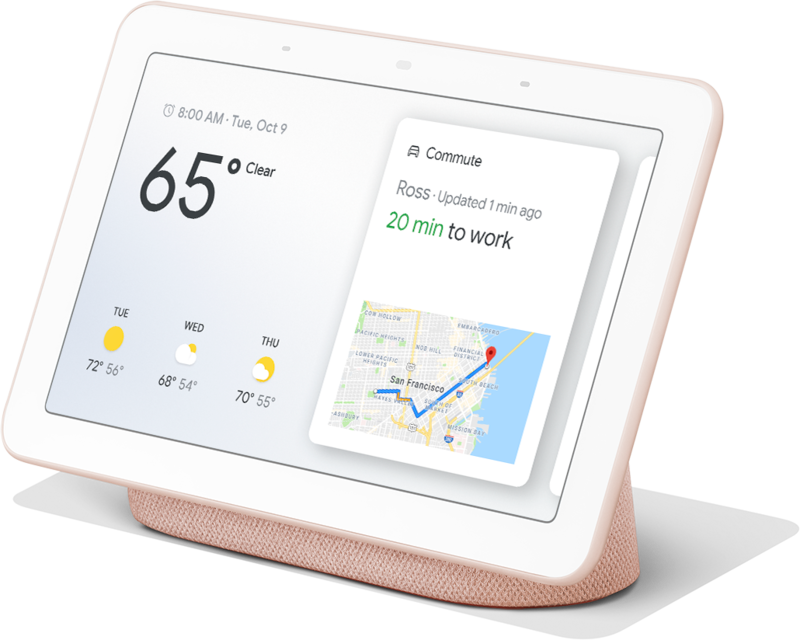 Functionally, the Hub works the same as other Assistant Smart Displays, but with a few updated UI elements and a new feature called Home View that gives you easy access and control for all of your smart home products. The speakers are referred to as "full range" with the specs listed as "80 dB SPL @ 1KHz, @ 1m" — they sounded plenty loud in my brief demo and should rival the original Google Home device for sound quality. The most important detail is surely the price. 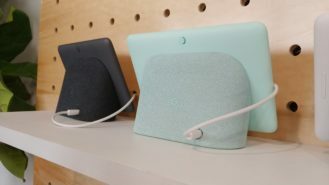 We knew it was going to be competitive, and it is — Google Home Hub costs just $149, going some way to explaining the lack of a camera (although Google also said privacy concerns were behind this decision). That's $50 less than the 8" Lenovo Smart Display and $100 less than the JBL Link View, but most importantly, it's $70 cheaper than Amazon's 2nd generation Echo Show, which is what Google is really going after with this product. To sweeten the deal even further, Google will give you six months of YouTube Premium for free with each purchase (until December). The Chalk and Charcoal colorways that already leaked are also joined by Sand ("not pink") and Aqua options too. The screen bezels are still white on each model, but with the UI being mostly white, that might actually look better. 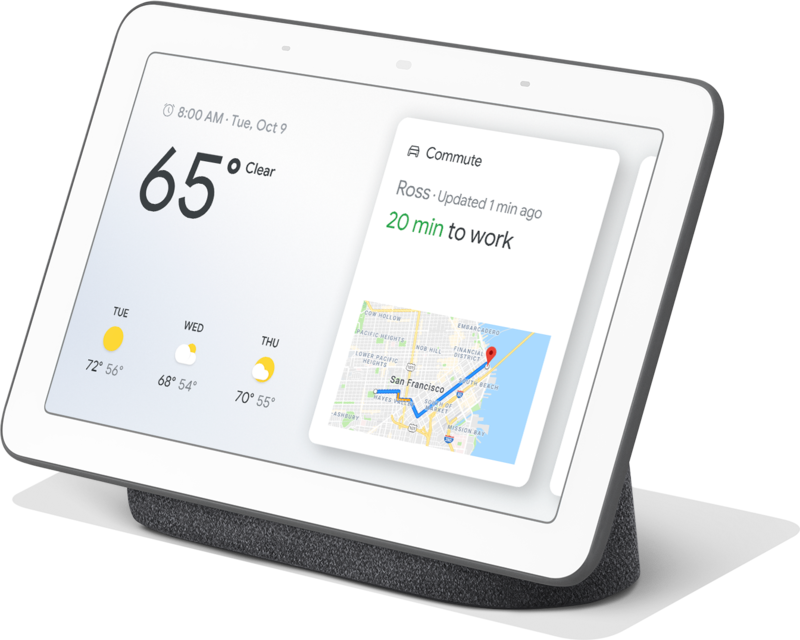 Google Home Hub is available to pre-order today and will be in stores from October 22nd in the US ($149), UK (£139), and Australia ($219).